Julie Bishop and the F word, a grave disservice to herself, to women, to all of us. Foreign Affairs Minister Julie Bishop delivered a thoroughly mind-numbing, vapid speech to the National Press Club in Canberra yesterday in which she reconfirmed that she prefers neither deep nor original thinking although she is certainly an assured and self- confident speaker who enjoys the limelight even when her memory for face and job recognition let her down badly at one spot. The consensus in today’s media, with its obsessive appetite for style over substance seems to be that it all went swimmingly. Some air heads and politics-wonks are even gushing that she appeared Prime Ministerial. They should all take a Bex and have a good lie down. Let’s not over-gild the lily, especially as we are a nation which has only recently demonstrated that any woman in the PM job, no matter how clever, capable or worthy will be crucified by the misogynists. Yet, to her credit, Bishop certainly proved she could remain blithely upbeat, upright and smiling while continuing undeterred despite some distinctly negative non-verbal feedback from her largely female audience; women she proceeded to patronise and diminish by the bouquet of platitudes, anecdotes and undisguised affection if not reverence for the patriarchal status quo that was the substance of her speech. Equality after all is something we can safely leave to up to powerful men to look after. I am absolutely confident at the right time the Prime Minister will promote other talented women we have in our party. It is held to be good manners to modestly acknowledge your privileged background. Bishop did this quite successfully without going into any real detail. She shared that she knew she had been very lucky. But she tried to pretend that even a life of privilege was in fact pretty ordinary. I acknowledge I have a very privileged upbringing as many women in Australia have. As a few of us have, Julie, you could almost hear her audience thinking. Acknowledging others present, however, proved not so easy. Nevertheless her efforts did add a bit of light and shade to her dull list of things to get through that were her notes. Some of this grated especially her faux sister-hood special hellos and twinkly grins of recognition to individual women she appeared to recognise even if she couldn’t get them on side. Intelligent women, educated women, distinguished women who battle inequality daily without feeling the need to pretend that it doesn’t exist. Women who were likely to be further alienated by her discourse’s end. Bishop’s performance was not unlike that of a plucky beginner unlikely to plunge into the deep end but a swimmer nevertheless and one who is not so risk-averse that she cannot enjoy herself even if her modest skills limit her to the shallow end of her 1950s tepid public swimming pool. If you tuned in hoping for a real contest of minds, however, you would be disappointed. It was not communication but more a sort of shallow interior monologue in which Bishop talked to herself in public, reassuring herself in a Panglossian delusion that we lived in the best of all possible worlds before an audience who knew better but were mostly too polite to tell her. Weary faces, set faces, disbelieving faces, bored faces looked up at Julie Bishop as she downloaded a tedious series of dreary clichés, commonplaces, unexamined assumptions, superficialities and tepid banalities in what you could tell she thought would be the sort of speech that all those women in the media were expecting of her. It was not. Instead she clearly bored most of her audience witless and inflicted upon them the curiously patronising complacency indulged in by privileged winners who conclude that because they have made it there must be nothing wrong with the system. Bishop also disclosed without intending to why she is part of the problem. Her attitudes, her perspective, her language all proceeds from a web of assumptions spun to help maintain the status quo. She appeared unrepentant and unaware of her role as an apologist for patriarchy and privilege. Some of her speech was saccharine. Some of it was sanctimonious. I pay tribute to all the women who have been cabinet ministers before me. It is not an inappropriate rhetorical gesture. But it is not something you do just by standing up in public and uttering thank you. It’s what you do. Many in the room were wondering how Julie Bishop’s deeds came anywhere near paying tribute to other ministers, especially given her reticence to lift a manicured pinky to protect Julia Gillard from the excoriating abuse and invective that characterised the best work of the opposition in its crusade to ditch the witch. Some, no doubt were muttering that it is politicians of her ilk that make the future even harder for the 1% of Australian women who even plan to enter politics. Questions frequently tested the deeper end of the pool. Surely, journalists assumed, lurking somewhere in the depths of a successful woman’s psyche is the motivation to work towards gender equality. Bishop’s words gave no hint of this. She settled instead for a type of girl guide’s promise. “The challenge I have set for myself is to do the best I can for those who will follow me. I feel that responsibility every day.” Doubtless Baroness Margaret Thatcher comforted herself nightly with similar platitudes. On the issue of gender barriers in politics, Bishop made very little sense at all other than appearing to be in deep denial. Or she pretended not to understand the question. Certainly she did not answer it. There were almost audible gasps from feminists attending her show as she neatly side-stepped structural gender inequality . I don’t think there is such a divide [between genders], in cabinet we deal with a whole range of issues and I have an opinion on every single one, likewise the males, of course they have opinions. But we do need to be more representative generally, we need diversity in our Parliament. Sharing her thoughts on the glass ceiling proved to be a continuation of Bishop’s blinkered run along the inside barrier. Here she makes a virtue of her habit of denial. Yet her description of her path to success does nothing to empower others, especially other women. I refuse to acknowledge it. I’m not saying it doesn’t exist, I’m not saying that at all. If I want to do something I will work hard and try to do it. If it doesn’t happen I’m not going to blame the fact that I’m a woman. I’m not going to see life through the prism of gender. Please don’t misunderstand my point, I’m not saying there is no glass ceiling but I’m not going to say my career has been stymied because of the glass ceiling. That would be inappropriate for someone in my position. 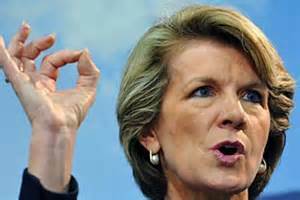 As Minister for Foreign Affairs, Julie Bishop would have ready access to United Nations documents. Perhaps we could direct her towards this UN summary: Women in every part of the world continue to be largely marginalized from the political sphere, often as a result of discriminatory laws, practices, attitudes and gender stereotypes, low levels of education, lack of access to health care and the disproportionate effect of poverty on women. http://www.unwomen.org/en/what-we-do/leadership-and-political-participation#sthash.WSIliEXn.dpuf From her answers at the Press Club, it is clear that Bishop would tell these women that they must not blame the fact that they are women. The answer, it would seem, is simple. They must work harder. By the end of her speech it was clear that Julie Bishop would see to it personally. Part of this would be achieved by having a public dig at feminism which in the Bishop scheme of things appears to be some optional extra, a type of optional accessory one may get along perfectly well without. It’s just not a term I use. I self-describe in many other ways. It’s not because I have a pathological dislike of the term, I just don’t use it. It’s not part of my lexicon, I don’t think anybody should take offense. I’m a female politician, I’m a female foreign minister. Yeah well? Get over it. There are many of us who can’t get over it Julie Bishop. You are an influential person from a privileged background and you occupy a position of no small social and political responsibility. You have done well and you are proud of it. The cards you were dealt from birth as you admit were stacked in your favour. Yet there is little in your speech to give hope to other women from less privileged backgrounds, the majority of women in the real world in their daily struggle for justice; their struggle for equality. There is little in your words of reassurance for them to take comfort in. There is on the other hand a disturbing complacency, a self-satisfaction and an almost wilful ignorance that will make the road you have travelled so much harder for other women.